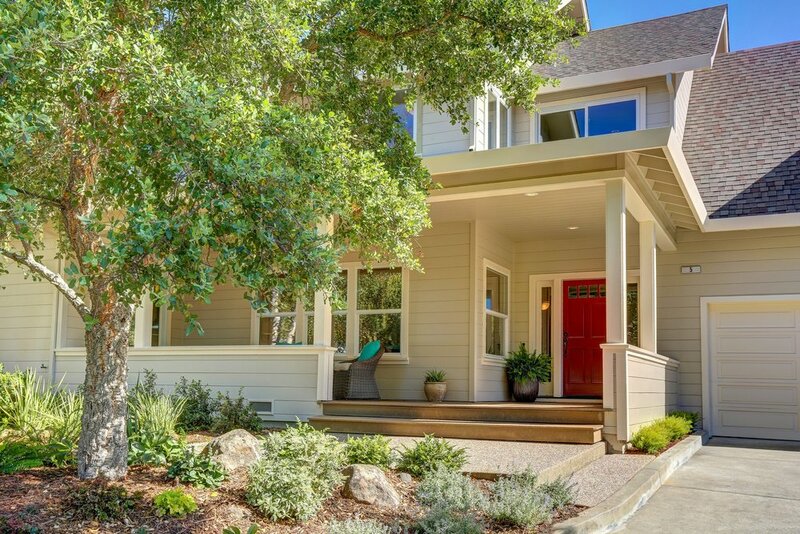 Nestled at the end of a private cul-de-sac, 5 Lois Court is a stunning, custom built home in a sunny, sought after neighborhood in Mill Valley. Built in 1996 with the upmost quality this 3,751± square foot home sits on a half-acre lot surrounded by breathtaking landscape. The home features 5 bedrooms, 3 ½ bathrooms and 3-car garage. 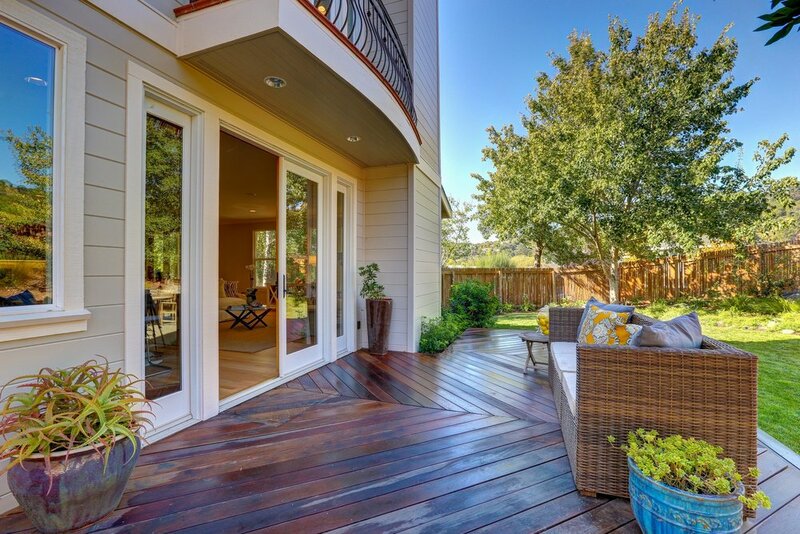 The floor plan is ideal for family life and entertaining. Scott Valley is a vibrant community within easy walking distance to Edna Maguire, a "California Distinguished" elementary school, Mill Valley Middle School, Tamalpais High School, Scott Valley Swim and Tennis Club, terrific hiking and biking trails and Alto Shopping Center with Whole Foods Market and great restaurants. 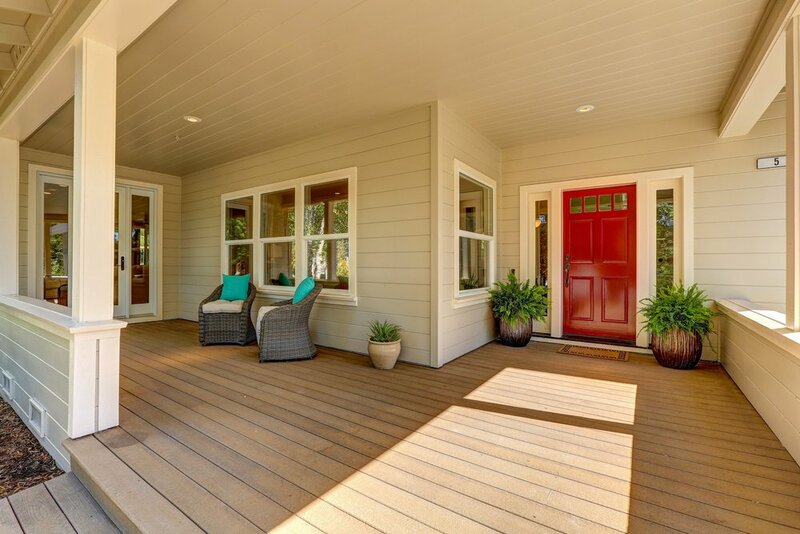 Main Level: The front yard has fantastic curb appeal and a shady front porch with French doors leading into the house. 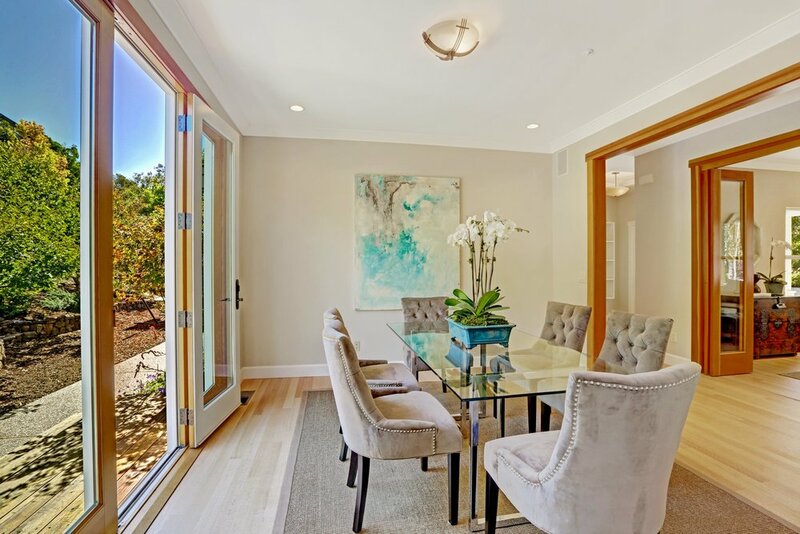 The primary living areas are all on this level including a spectacular Great room that opens onto a large Brazilian hardwood Ipe deck and level back yard through Anderson French doors. 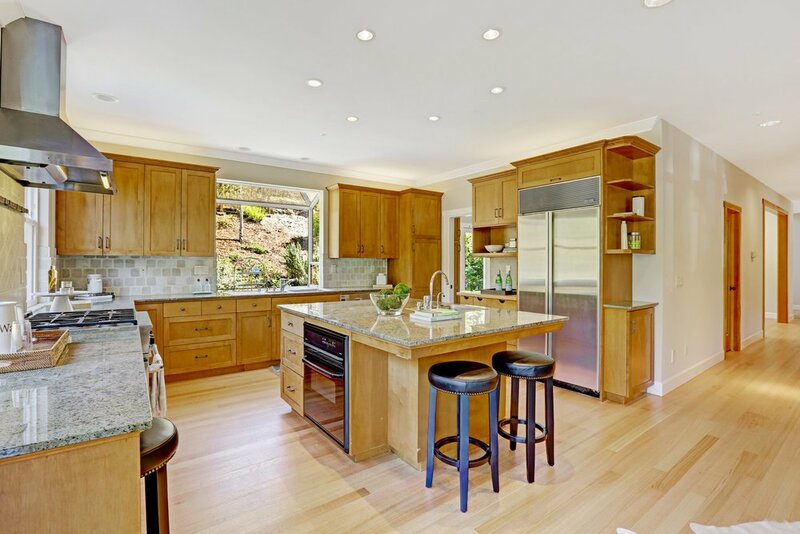 Adjacent is a large open kitchen designed by Sandra Bird of Larkspur with a large island and ample maple cabinetry. 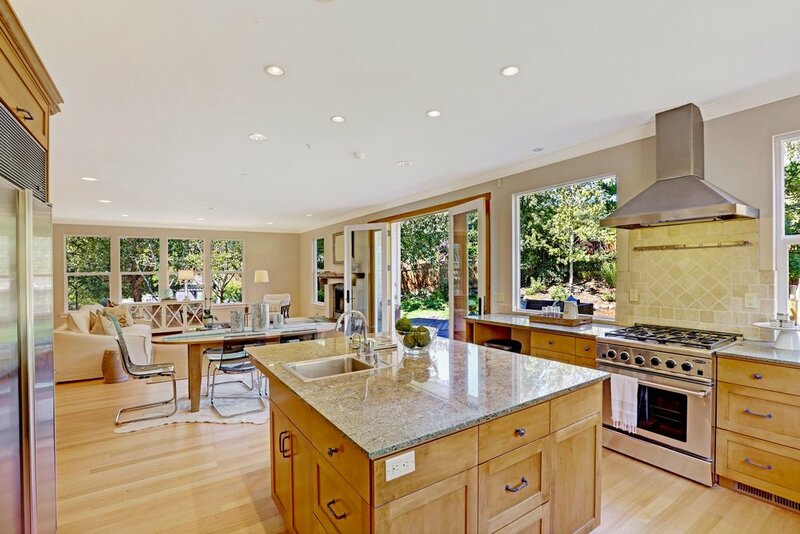 Appliances include a Sub-Zero refrigerator, Miele dishwasher and a DCS 5-burner range. More storage is conveniently located in the attached walk-in pantry with butler's sink. The formal dining room opens to a patio. 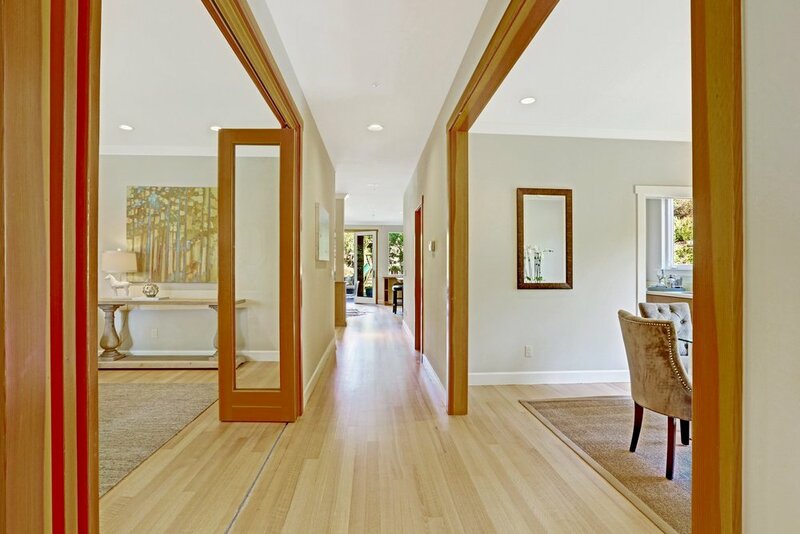 A separate room can be used as a media/living room or office and has custom built doors for privacy. 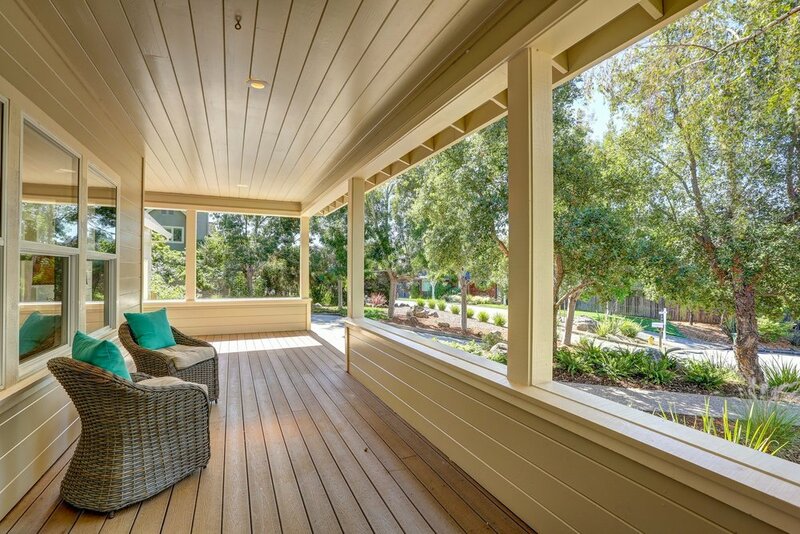 Throughout the main level are newly re-finished ¼" sawn Red Oak floors, 9' ceilings and a built-in sound system. 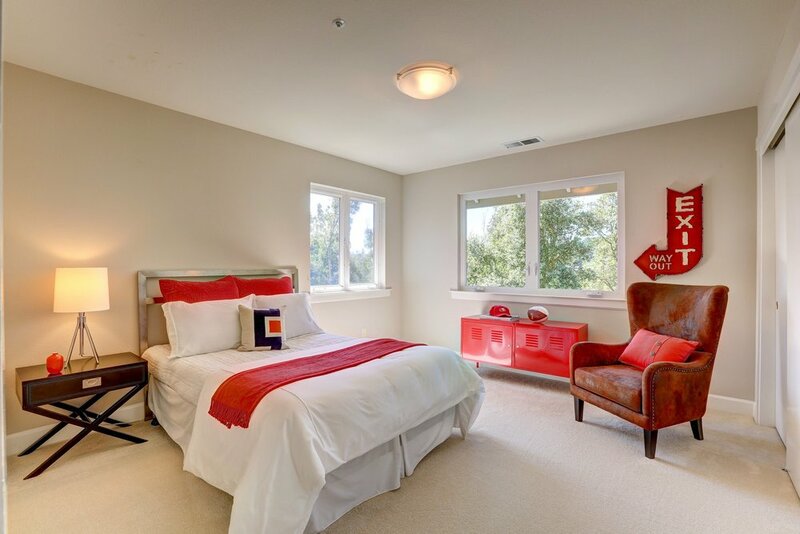 Upper Level: The five bedrooms include the luxurious Master suite featuring vaulted ceilings, a walk-in closet with built-ins and private balcony overlooking the backyard. A spacious Master bathroom has a double vanity, a spa tub and tiled shower. 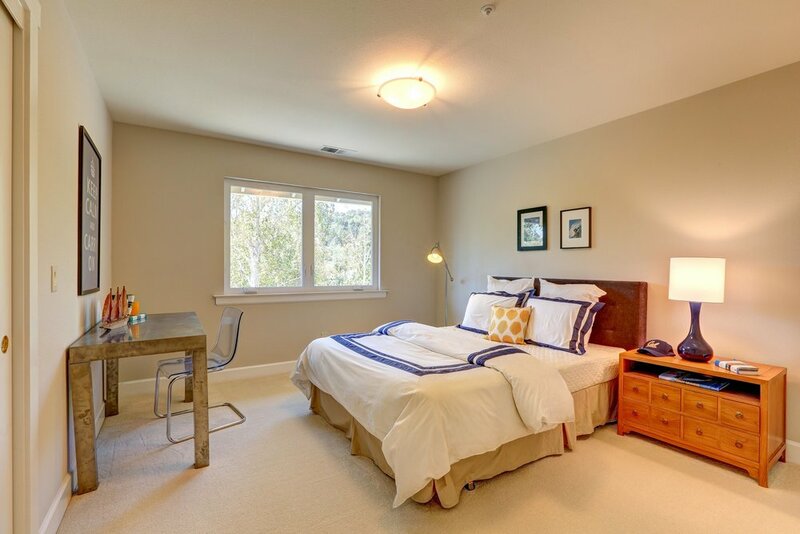 The four other sizable bedrooms offer versatile space for children and guests alike. A nearby full bathroom has double sinks and a separate shower/toilet room. 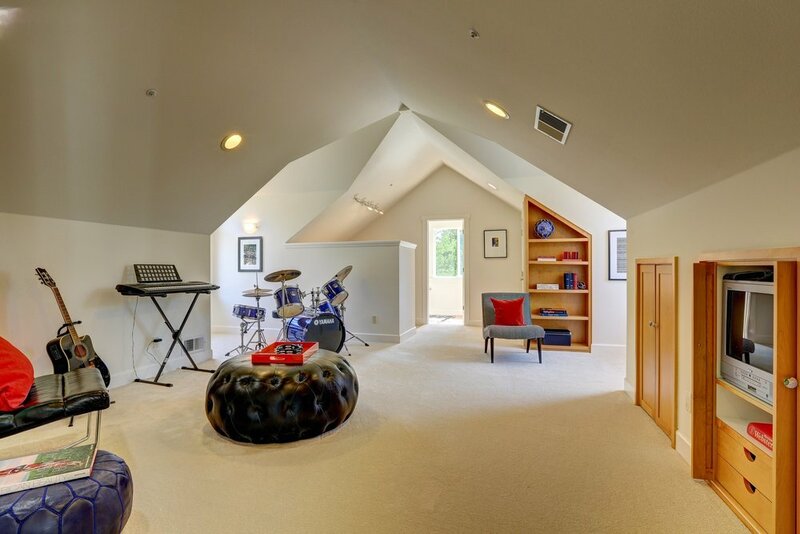 The largest guest bedroom can serve as a playroom, music room or guest suite and features custom built-in Maple cabinetry and a full bathroom. The entire upper level has 9' and vaulted ceilings, extra wide stairs and hallway and is newly carpeted. 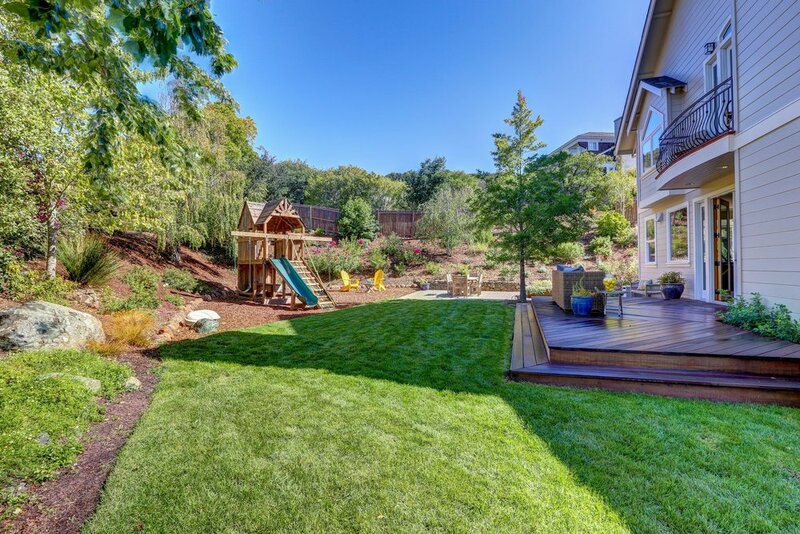 Grounds: The mature landscaping is drought resistant with many sunny and shady outdoor areas to interact with nature and wildlife. A new irrigation system was installed and covered with nutrient rich soil and thick layer of mulch. 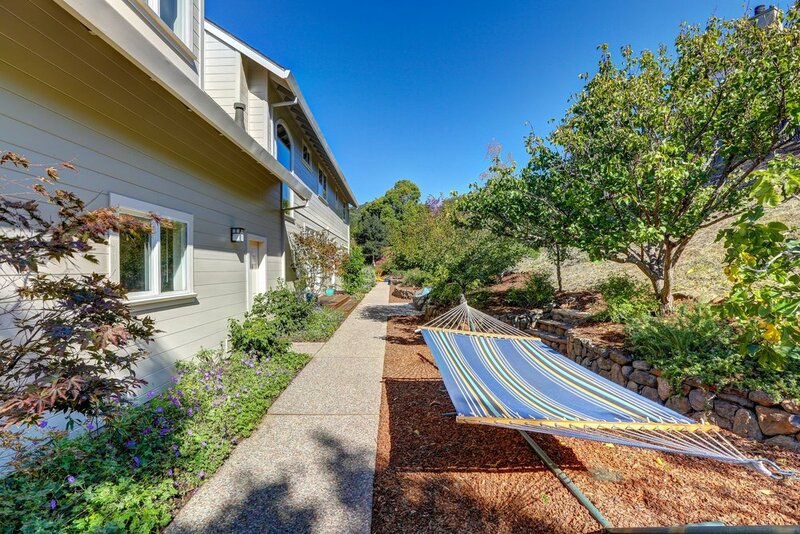 In the front mature Oak trees provide shade over a stone paver patio surrounded by roses. 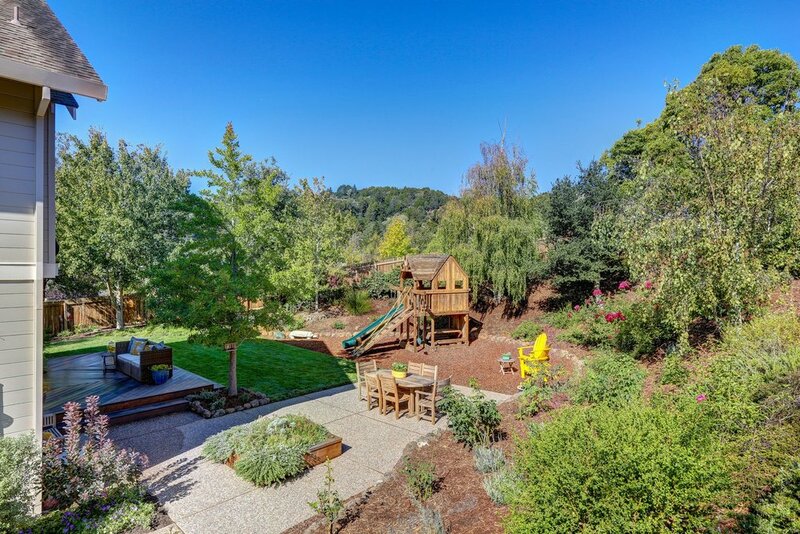 The large, level backyard has a redwood play structure made by Rainbow and is surrounded by birch and maple trees and a hillside of roses. 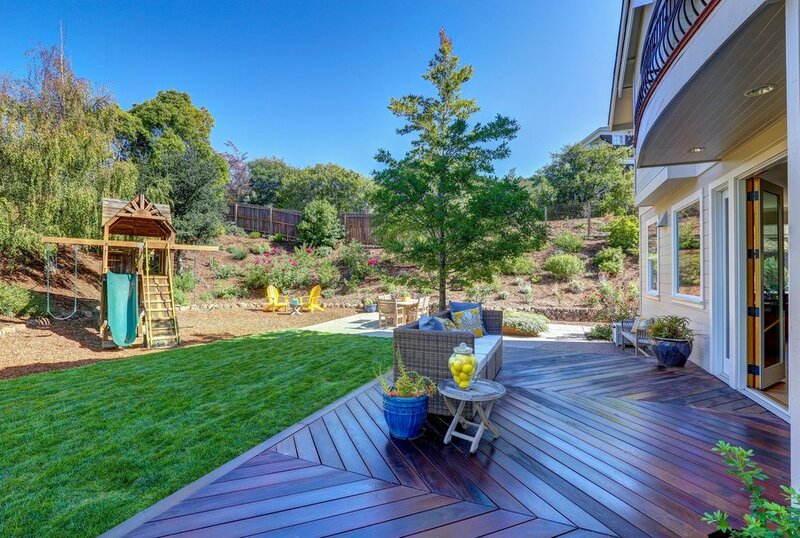 In the rear of the house is an additional patio with fruit trees, a play area and vegetable garden. A detached shed provides extra storage for bicycles and garden tools.